* Member of the ThinkingPets Guild. Clients receive information on habituating dogs to the vet to make this a fun & positive expereience. Basic TTouch explained and demonstrated in class. Clicker/reward marker training methods explained, demonstrated and encouraged, but not compulsory. A clicker is provided as part of the course cost. Ground Work (obstacles, different surfaces etc) every week to build confidence, balance and encourage owners and pups to have fun! 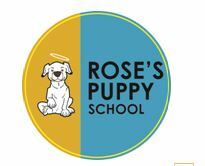 My Puppy School has been going for 15 years. It takes place in our garden so there is a lovely shaded area and a garage to shelter in if it rains. The vets in the Helderberg area have been fantastically supportive. With my own dog training experience and vet nurse training it was a natural progression to running classes. I’ve attended a lot of seminars and courses, including Ray Coppinger, Hills, and veterinary congresses with behaviour lectures. In 2010 I completed Thinking Pets’ Confi-Pup course to ensure I was offering the most up to date, informed classes possible and appreciate their ongoing training and support.